Shopping for some gold or mustard color dress shirts. 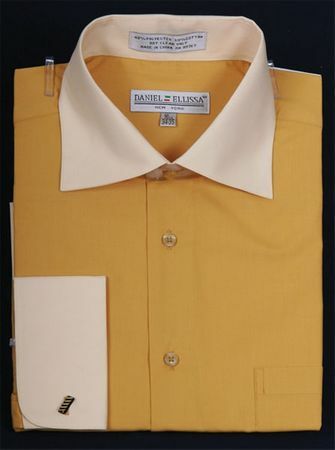 Why not try some of these 2 tone mens dress shirts from Daniel Ellissa. Designed in Italy, these mens dress shirts feature Italian style that You will love to show off wearing. Made of Cotton/poly fabric. Please note that Collar and Cuffs are a soft butter yellow color.